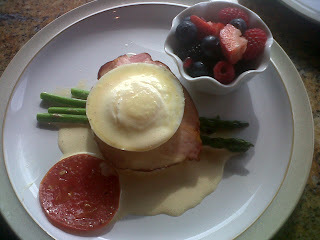 In case you missed it, this summer I did Part Un and Part Deux for breakfast. I thought I would share a weird fact about my relationship with breakfast. After I finished working at Hunewill Guest Ranch where I used to be the breakfast cook, I didn't eat breakfast for probably about 3 years. I forced my sister to always pick a breakfast place that served lunch for breakfast. I was scarred by all the eggs and bacon I made in the course of a summer. This breakfast protest has been over for a few years now and I really enjoy making it. Breakfast is so much fun because you can take whatever random stuff you have in your fridge, throw it in some eggs, and add some cheese and voila you have a delicious meal. And did I mention Mimosas & Bloody Mary's. I am pretty sure day drinking is one of my favorite things. Heat Butter to absolutely boiling. It may seem like a small amount of butter but you need a big container to heat it up. It boils up because it gets so hot. I learned this the hard way and had to clean up a lot of butter out of a microwave. Make sure to put it in a container that can take high heat. On the yacht, it was in the microwave for four minutes. Put the other ingredients in the blender. Add the boiling butter slowly as you blend. The butter cooks the eggs. Pour on top of an english muffin, canadian bacon, and a poached egg.....or pour it on any version of this you want. It is just breakfast, have fun & be creative. I love the silicon egg poachers they have these days but I also love Missy's perfect egg making tip on her Egg McMuffin post. Open up all three cans of biscuits and cut each biscuit into quarters. Next, combine the white sugar with 2-3 teaspoons of cinnamon. (3 teaspoons of cinnamon gives it a fairly strong cinnamon flavor. If you’re not so hot on cinnamon, cut it back to 2 teaspoons.) Dump these into a 1 gallon zip bag and shake to mix evenly. Drop all of the biscuit quarters into the cinnamon-sugar mix. Once all the biscuit quarters are in the bag seal it and give it a vigorous shake. This will get all those pieces unstuck from one another and nicely coated with cinnamon-sugar. Spread these nuggets out evenly in the bundt pan. At this point, you’re going to want to melt the two sticks of butter together with ½ cup of brown sugar in a saucepan over medium-high heat. This can be light or dark brown sugar. Cook butter/sugar mixture, stirring for a few minutes until the two become one. Once the brown sugar butter has become one color, you can pour it over the biscuits. Bake for about 30-40 minutes until the crust is a deep dark brown on top. When its finished cooking, remove it from the oven. If you have the willpower, allow it to cook for about 15-30 minutes before turning it over onto a plate. Here is the thing- you really have to take this to the next level by adding frosting and pecans. That way it is exactly like the middle of a cinnamon roll. Blend together and you can add a little milk if it is too thick. You can also take it to the next level by using half a block of cream cheese. Yes, I know. The beauties like the good life. Ah man, I needed you to post this yesterday when I did my Amazon order. I want those silicone egg poachers. And thank you for posting Aunt Donna's frosting recipe. There was no other monkey bread like the one we had at Rachel's -- the frosting was the key. It wasn't until a few years ago that I developed an appreciation for hollandaise sauce and now I love it. I've never made it and am excited to try your recipe - you make it sound easy! And perfect timing right before Easter. And thank you for documenting the best monkey bread recipe - your frosting takes it to a whole new level! Yum! Eggs Benedict is one of my absolute favorite things to eat. I also agree that day drinking is fabulous. Such a way to feel lucky in life! One of my very favorite breakfasts is Eggs Benedict. I think I have it every year on my birthday. And I didn't even know it existed until you, Megan, introduced me to it at a restaurant in Bishop all those years ago!